Minestra di Pane is a fresh bean and vegetable soup and Ribollita is same soup reheated and slices of bread added. Actually, this is my take on this classical Tuscan peasant soup. 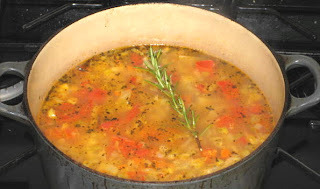 Mind you, even in Tuscany they can’t agree what is a true Ribollita but one thing they do have in common is that it is best when reheated. I used whatever root vegetables I had on hand and since I was out of dry navy beans but had one can I run with that. Also, no Italian bread on hand except Ciabatta so decision was made to toast slices and rub both sides with garlic and serve along side instead in soup itself. 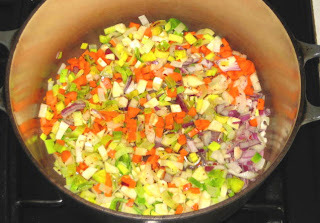 In a heavy pan or Dutch oven sauté leak, onions, carrots, celery and parsnip in olive oil till soft but not discolored. Add stock and liquid from beans and simmer for about 15 minutes. 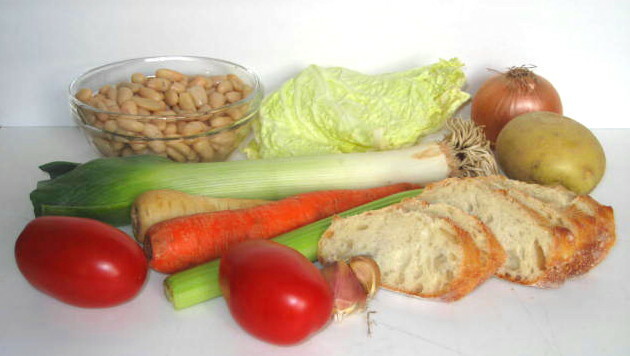 Add cabbage, potatoes, tomatoes and garlic and simmer additional 15 minutes and then add beans and rosemary. Simmer to warm up the beans. Now it is ready to be served as Minestra di Pane. 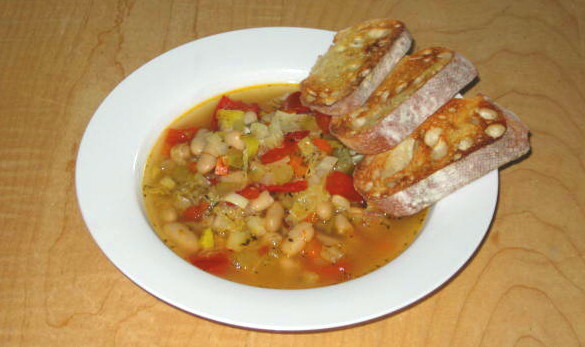 To serve as Ribollita add stale rustic Italian bread cut into cubes and place into serving bowls. Pour reheated Minestra di Pane on top and it is ready to serve. You can grate Parmigiano-Reggiano on top if you wish.